This is a book of negotiation stories that apply techniques Dr. Klatt has learned since 1972, the year he began his career as a professional real estate licensee negotiator. They are techniques that were learned in the School of Hard Knocks, the best learning place of all. This book is not intended to be a complete presentation of all areas of negotiation, negotiation practice, or negotiation theory. It is intentionally short on theory and long on stories. It is so much easier (and more fun) to remember stories than theory, and if you remember the story you will be able to work back to the theory. 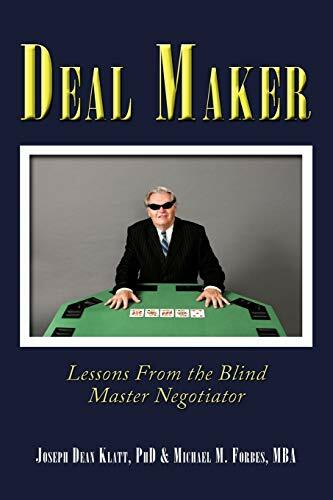 It is a book written for real estate agents, law students, attorneys, mediators, and anyone else for whom negotiations are central to their career. In a sense, this means that this book has been written for us all. For we are all professional negotiators. Dr. Klatt was a strapping San Diego City lifeguard, excellent athlete, competitive surfer, ambidextrous tennis player, and drag racing champion before an accident robbed him of his sight. That was an event that could have broken the spirit of lesser men. Instead, Dr. Klatt turned his physical short-coming into a vector for professional excellence. He went on to sell a portfolio of property that has a present collective value that is easily worth hundreds of millions of dollars, and he did it all without ever laying sight upon one single inch of the property that he sold. This book is his method. Dr. Klatt was robbed of his sight in a freak auto accident at the age of 19. He went on to sell a portfolio of real estate property that has a present collective value that is easily worth hundreds of millions of dollars, and he did it all without ever laying sight upon one single inch of the property that he sold. How did he do it? He did it, in part, by being a good negotiator. In part, by being a good listener. In part, by being a decent, honest human being. He has no sight, but he mastered the art of listening, trained himself in the skills of negotiation and mediation, learned to hear what speakers leave unspoken, and made language his friend. He has blended the manners he was taught as a child with Christian morals and professional ethics to develop a negotiation style that is all his own. Joseph Dean Klatt was born the oldest of four children in Fond du lac, Wisconsin. Dr. Joe, as his friends call him, operates Klatt Realty Inc., a full-service real estate brokerage in La Jolla, California (www.KlattRealty.com.) He has since become a father to two sons, Joseph Franklin Klatt and James Dean Klatt. Dr. Klatt has traveled the world while variously in the company of six German Shepherd Seeing Eye Dogs: Rani, Pegasus, Marvel, Churchill, Ken, and Lawson. (He and Ken even made it so far as Anchorage, Alaska.) Dr. Klatt is an internationally recognized mediator and negotiator. His doctorate in Real Estate Law was conferred by the University of Shelbourne.